Tim Leefeldt turns industrial artifacts, like these vintage glass telegraph insulators, into unique lamps. 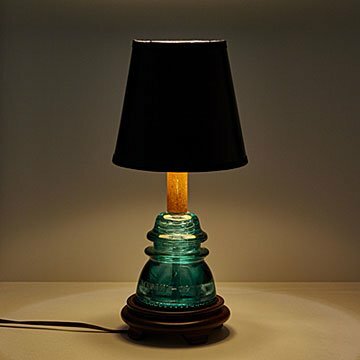 The vintage glass telegraph insulators Tim Leefeldt turns into industrial-style table lamps are authentic artifacts of telecommunications history—but they're also more than that. Enabling urgent messages coded in dashes and dots to speed from sender to receiver, each lamp was a silent witness to people's most memorable events: weddings, births, deaths, etc. Believing they were manufactured between the 1920s and 1950s, Tim rescues them from forgotten retirement (and landfills) by adding electric lamp innards, a cherry wood base, and a black shade to each. The shade's reflective gold foil lining creates a beautiful glow on the colored glass of the insulator when the lamp is switched on. Kind of like the nostalgic glow of the past, when seen from the present. Handmade in Chico, California.